Javelina season was upon us once again. The thoughts of stalking the crafty gray ghosts of the desert were beckoning me to get away from work, leave the chores at home, and seek the enjoyment of the great outdoors. This year I would attempt to put javelina steaks in the freezer using my bow during archery season. I scored my first archery season (1995) after a seven-day hunt with my brother. In hunts prior to that I had a couple of successful seasons of handgun hunting so I thought I would give archery a try. It seemed easy enough to get within handgun range; I figured what are a few more yards. The little buggers would soon teach me what a few more yards meant. In seasons since, I have come to realize that the first archery season success may have been more beginners luck than skill. I love the archery and H.A.M. seasons. 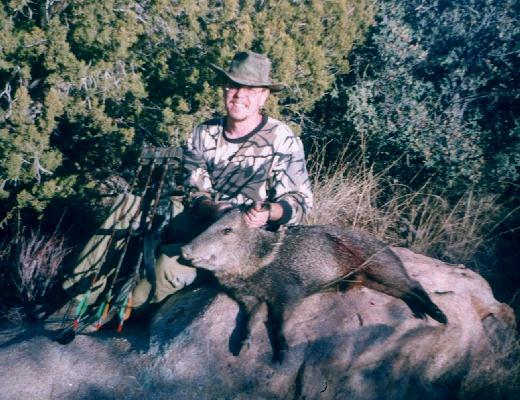 There is a lot less pressure on the javelina and you get a chance to sharpen your hunting skills. Granted javelina do not have good eyesight but you still need to practice checking the wind and practicing patience. I try to get within at least 20 yards, so stealth, covering your scent, and anticipating your quarry’s next move is part of the challenge and the fun. Opening morning this year was cool and crisp. It was 22 degrees in camp and we were eager to get started. A little walk would be the thing we needed to warm us up. By 9:00AM Rick had spotted a herd. Via radio communication I told Rick to make his stalk and I would catch up to him. A few minutes later I was a couple of hundred yards above Rick on a side hill so I could see all the action. 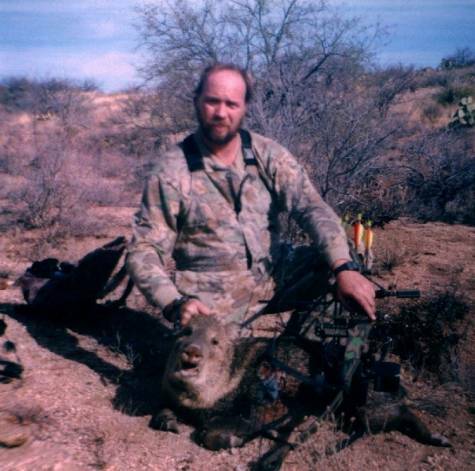 He was making his stalk on a javelina about 75 yards ahead of him on the end of a ridge. Unbeknownst to him the remainder of the herd was just over a rise about 30 yards from him. He had turned his radio off to make the stalk so I could not indicate to him the situation that I could see from my vantage point. They caught his scent and they were off to the races. They were taking to the brush in a hurry and I could not get into position to cut them off. Bummer . . . Hunting javelina in the brush with a bow was not what I had in mind for today. I could see this was going to be a test of nerves. Who had more patience the pigs or us? I was betting on the pigs. After waiting for about an hour I began a slow stalk through the brush that I had seen the majority of the javelina go into but did not come out of as far as I knew. I managed to make a lot of noise and kick out nothing. I figured they must have snookered me and sneaked out of the area, but I also know how the little buggers can hold tight so thought I would get up high and wait them out. I was hedging my bet that they were still in there. Rick and I got up on a knoll overlooking the area and began to glass for the pigs. Lunch came and gone and the pigs were winning the patience game. About 1:00, we spotted a couple of hunters and watched them walk through the same area that I thought the pigs were in. They did not kick out anything either. They circled around the area and moved off after spotting us.About 2:00, persistence paid off and we spotted a single pig come out of the woodwork. We watched it for several minutes and decided to try for it. It went over a saddle between two hills and disappeared into some more heavy stuff. Snookered again! We walked back to the side hill we were originally glassing from and sat down to glass some more. Surely there had to be more pigs in there than just one. I had seen at least seven go in there earlier this morning. Patience, I kept telling myself, let the sun get a little lower in the sky then they’ll come out to play. It was in the mid seventies that afternoon so I guessed they were still held up in the cool dark underbrush. At about 3:30 in the afternoon my suspicions proved true. We spotted four javelina moving out through the brush. I knew they were in there! We started our stalk after them and went to the spot were we had last seen them. Again we lost them in the cover. We moved slowly and as quietly as possible between open spots in the brush. At about 4:00 I spotted two others about 100 yards ahead of us heading in our direction. There was a small knoll that they were heading toward. I was not sure which side they were going to go around it on, so I motioned to Rick to circle around the backside. I got into position giving myself a couple of shooting lanes through the bush and waited them out. Bingo! I spotted them in the bush slowly working toward me at about 30 yards. They were following a trail on the side hill, which would put them broadside to me at about 20 yards. Unfortunately the only opening in the brush there was about the size of a pig. It would be a tough shot and that was if they were kind enough to step into it. I drew my bow, put my sights in the opening and waited for them to cover the remaining 10 yards. Yes! The lead pig was going to walk into the opening. The rest would be up to me. When it crossed my sight pin, I let drive. The pig flew out of there like a shot. It ran around me crashing through the brush. I stood still looking for the second pig but could not spot it. A minute later Rick crested the little knoll after hearing my shot. I signaled him that there was still a pig below him. Another minute, a couple of steps by Rick, and the pig lost its patience. It busted out of there as fast as it could go. It was only a few yards behind the one I shot and froze solid when it’s buddy took out of there. I didn’t see it until it moved. They don’t call them the gray ghosts of the desert for nothing. With the second pig gone I went to look for a blood trail. I went to where I shot the pig and did not see any. Did I miss? I didn’t think so but a small doubt started to creep into my mind. I followed his tracks through the bush and found blood after about 15 yards. Rick had stayed behind to look for my arrow. He pulled it out of the bush, behind where the pig was standing when I took the shot, and it was covered with blood. Now I was excited and started to follow the blood trail. I went about 60 yards further and could hear a pig wheezing and coughing. It was close and I realized in my excitement that I did not give the animal enough time to lay down before pursuit. If it heard me and took off I may never find it. It started coughing again and this time I was able to pinpoint it. It was only about 10 yards in front of me in a little pit. I watched him take his last breath and was relieved that it was over. Rick came over and we took some pictures. In the middle of picture taking I spotted three pigs across the creek and Rick was on the move. He was about 30 yards below me in the creek crawling through brush when he came face to face with two javelina. He was surprised that they were that close to us since we were talking a few moments earlier just above them. If he would have had an arrow nocked he said he could have had a shot. Needless to say they did not stick around to give him a chance to nock one. He continued his pursuit of the other three but lost them in the brush. I finished cleaning up my pig and started packing it out toward camp. The next day we spotted singles and doubles and tried to get Rick in on them. There was no wind and the pigs were a little skittish from the day before so we were unsuccessful at getting Rick a shot. Another friend would be coming out next weekend so we would give it a try then. Next Saturday came and Mike joined Rick and I to try his luck at those rascally javelina. It was mid morning and we were not having any success finding them. Rick and Mike decided to head over to the area where I had shot mine the weekend before and I decided to head in the opposite direction to see if I could find any sign. I positioned myself on a knoll and began to glass. I glassed for about an hour without seeing any movement other than a coyote. I turned around to glass behind me in the direction from which I had come the hour before, just for giggles. I spotted a pig going over a rise about 200 yards behind me.I got on the radio and told Rick and Mike that I had seen one and was going to move to where I seen it go over the hill in hopes of being able to keep an eye on it. In the mean time they were going to go to a hill I had been in position on early in the morning. There was only a slight breeze this morning so it was very noisy. I crested the hill where I saw the pig earlier and ran smack into about three pigs grazing on cactus about 40 yards in front of me. I was in too close to risk backing out or using my radio to contact Rick and Mike. I could see Rick and Mike on a hill about 500 yards in front of me and knew they were looking for me. 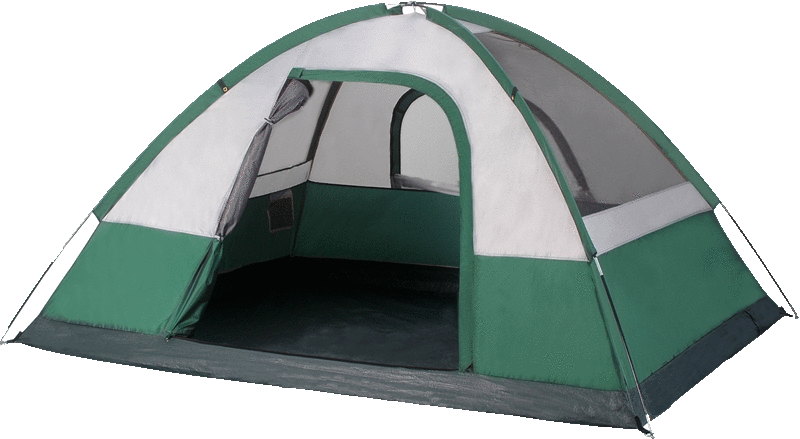 After several minutes a gust of wind came through and I used it my advantage to get on the radio. I told them I was just across from them and down the ridge a ways. I stood up and they spotted the pigs and me. Unbeknownst to me there were more javelina in the herd just over a little ridge from the three I was watching. Mike and Rick got into position and waited for the herd to come. I stayed back with the three I was watching until they crested the ridge moving to the rest of the herd. It was up to Rick and Mike now so I sat quietly and listened. After about 15 minutes I heard an arrow slap something. I saw one pig come running up the creek past me. A minute later I heard another shot that sounded like it connected. Then another and pigs were running everywhere. I had one come by me at about 15 yards. I walked over the ridge where the pigs came from and found Mike. He said they were in position waiting for the pigs when a coyote crested the ridge and came down into the herd. Mike took a shot before the herd was aware of the coyote and missed. That was the first arrow I heard. Mike said then the big bore in the herd started chasing the coyote to drive him away. He drove the coyote right at Rick and the coyote turned 90 degrees upon seeing Rick and went over the ridge from whence he came. Rick said the boar stopped right in front of him at about 25 yards and gave him a broadside shot. The arrow found its mark and the pig went about 150 yards before falling over dead. In the meantime Mike had taken another shot and missed. After the third shot the pigs scattered. Rick said he needed to find that coyote and thank him for bringing that pig to him. He said if that hadn't happened the pigs were too far away from him to get a shot and they were moving away from him as well. We hunted the rest of Saturday and Sunday trying to find the pigs for Mike but were unsuccessful. He was not complaining though because he got shots and had a lot of fun. As with any hunt it is the hunt itself and the comradery that are most cherished. Taking home some meat is icing on the cake.